It is now obvious that GOD is conspiring against me. Well, maybe not me (I hope!) but against curtains for the library of the Cross House. 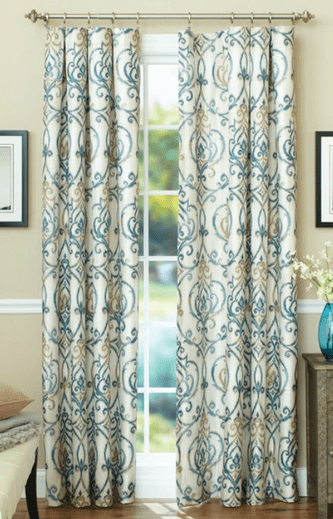 In my two previous posts, I detailed the great adventure in finding curtains. In the first post, all was lost. In the second post, all was saved. Whoee!!!!!!! But now, all is lost again. Thank you for shopping with Walmart.com. Unfortunately, due to an error processing payment information, we have had to cancel the following order. Huh? My credit card was fine. So, I assumed a computer glitch, and placed the same order a second time, and changed the payment to another credit card (also fine). Ten minutes later? The same error message. I called Walmart. After waiting 14 minutes to speak with a human, the very nice person tried to find out what was going on. After being put on hold again, she eventually returned with: “I cannot find out what the problem is.” She suspects the item may be out-of-stock! In my entire life, I never ever thought curtains could be frustrating. Who knew? Destined. Never. To. Be. Mine. Well, there are 4 of the short ones here in Pittsburgh…. I suspect that when you try to check out, this will prove incorrect! Try Amazon, I see them there, in both sizes. Tried that earlier. There are only 2 panels available of each size. I need eight. These are gorgeous! Just a suggestion? Hope the link works? Hey Ross, just checked the Wal-Mart up here so in Lawrence, and there happen to be five 52 x 84 inch curtains like the ones you need. As it so happens, I’ll be headed down to Emporia on Wednesday, so if you want I can get them all and bring them down there. Yep. We’ll be down around 4:30 that day, so if you want we can swing by sometime that evening. I’ll take that as a yes? Yes! I sent you an email. Did u get it? Yep, we’ll get the curtains tonight and be down Wednesday. See you then! Something as simple as curtains can bring folks together! I checked at Walmart here today, but that brand is not carried in Canada. I can’t wait to see the room all painted, with the coveted curtains hanging proudly! If you’re still needing any more of these elusive panels Ross, there happen to be 4×84″ hanging on a rack in Lafayette IN!! Wow! Thanks, Cody! But I am good to go now! I have lots of wonderful old things that need to find a new life, new places to be seen. I am selling off so much of what I collected for years. I have sets of curtains that are quite unusual, beautiful and probably late Victorian. Red and gold on cream. I can go looking for them if you would like to se them. Very unusual. Sue, I would love to see your curtains!